Anthera Pharmaceuticals is a biopharmaceutical company focused on developing and commercializing products to treat serious diseases associated with inflammation, including cardiovascular and autoimmune diseases. Anthera has three late stage clinical products: varespladib methyl (A-002), A-001 and blisibimod (A-623). Varespladib methyl (A-002) and A-001 are designed to inhibit a novel enzyme target known as secretory phospholipase A2 (sPLA2). Elevated levels of sPLA2 have been implicated in a variety of acute inflammatory conditions, including acute coronary syndrome and acute chest syndrome, as well as chronic diseases such as stable coronary artery disease. Blisibimod targets elevated levels of B-lymphocyte stimulator (BAFF) which have been associated with a variety of B-Cell mediated autoimmune diseases, including systemic lupus erythematosus (lupus) and rheumatoid arthritis. So, what is the reason that ANTH % Held by Inst is 93.49? To determine whether 16 weeks of treatment with A-002 plus atorvastatin and standard of care is superior to placebo plus atorvastatin and standard of care for reducing the hazard of the first occurrence of the combined endpoint of cardiovascular death, non-fatal myocardial infarction, non-fatal stroke, or documented unstable angina with objective evidence of ischemia requiring hospitalization. Anthera Pharmaceuticals, Inc. (NASDAQ: ANTH), a biopharmaceutical company developing drugs to treat serious diseases associated with inflammation, today announced it has completed enrollment in the Phase 2b PEARL-SC study. PEARL-SC (A randomized, double-blind Phase 2b study to evaluate the efficacy, safety, and tolerability of blisibimod administration in subjects with systemic lupus erythematosus) is examining the therapeutic benefit ofweekly and monthly subcutaneous injections of blisibimod in patients with active and antibody positive systemic lupus erythematosus (SLE). The targeted number of five hundred and forty (540) patients has been randomized in 11 countries and 72 clinical sites worldwide. Also, as part of the Company's efforts to improve treatment options for patients with SLE, the Company submitted a protocol amendment to the FDA for the PEARL-SC clinical study that proposes a modification in the primary efficacy SLE response index to require a larger decrease in the SELENA-SLEDAI* clinical assessment score. The proposed primary endpoint will require patients to demonstrate a greater than or equal to five (>5) point reduction in the SELENA-SLEDAI, a well-recognized clinical assessment of lupus activity. The remainder of the responder index will remain unchanged with no new BILAG A or two new BILAG B organ domain flares, and less than a 0.3 (<0.3) increase on a three point scale in Physician's Global Assessment. "As we move forward with the development of blisibimod, we are incorporating feedback from industry experts, physicians, and key opinion leaders regarding the potential for blisibimod to provide incremental benefits to patients with systemic lupus erythematosus compared to currently available therapies and other advanced stage clinical treatments," said Colin Hislop, MD, Senior Vice President and Chief Medical Officer. "Completion of enrollment in the PEARL-SC clinical study and the proposed change to the primary endpoint may allow us to accelerate our development efforts and further differentiate blisibimod from competing therapies." The proposed amendment to PEARL-SC also includes an option for an interim efficacy analysis to be conducted by an independent statistician after the 350th enrolled subject has reached 24 weeks of treatment - the primary efficacy time point. A successful interim analysis would require statistically significant improvement of the pre-defined SLE responder index of at least two pre-defined time points - one of which must be 24 weeks. The proposed interim efficacy analysis would be completed in Q1 2012 with the possibility of stopping the study early for efficacy using a pre-defined stopping rule. May be both these facts explain why funds like ANTH so much and accumulated 93.49% of stock. If even one trial is positive ANTH pps in Q1 2012 might be doubled or tripled. Acute coronary syndromes (ACS) is a term used to describe a group of conditions resulting from acute myocardial ischemia (insufficient blood flow to heart muscle) and ranging from unstable angina (increasing, unpredictable chest pain) to myocardial infarction (heart attack). The conditions are related to varying degrees of narrowing or blockage of single or multiple coronary arteries that provide blood, oxygen, and nutrients to the heart. This life-threatening disorder is a major cause of emergency medical care and hospitalization. Coronary artery disease (CAD) remains the leading cause of death in the United States. Well, even now HGSI has cap >$1.5B because of lupus drug. It's much cheaper than HGSI and some big pharma can buy it easy. 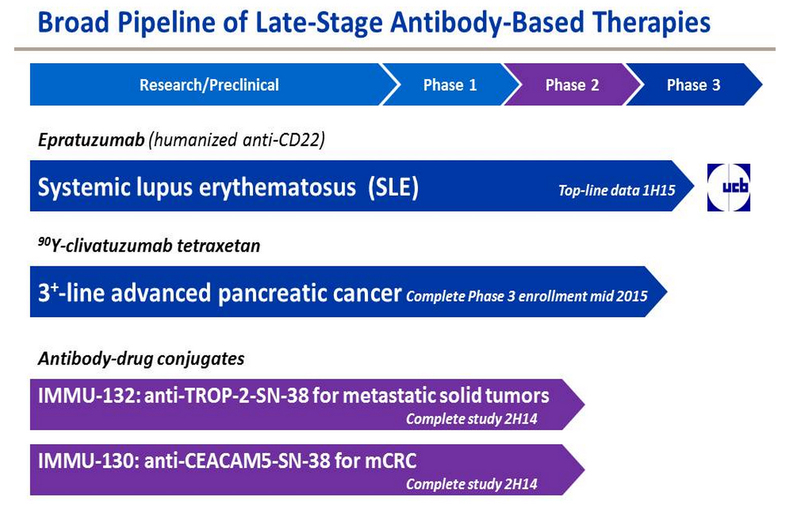 After GILD/VRUS case even $1B offer for 2 drugs (lupus and ACS) that in phase II/III trials will not be big surprise. Disclosure: I bought 3k of ANTH today, will keep it before news release. 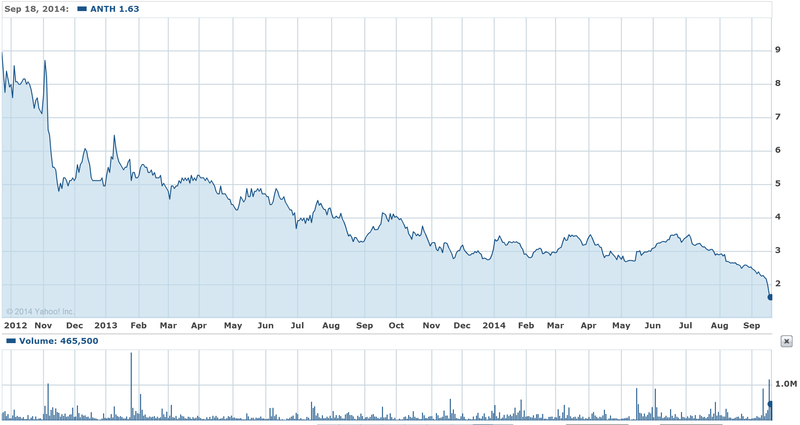 ANTH pps is $1.61 (lowest for 5 years period) and cap is just $36M ​​... Should biotech investors buy ANTH now? Our Phase 3 lupus clinical study, CHABLIS-SC1, is recruiting at 12 countries in Eastern Europe, Latin America and Southeast Asia. In July, an independent Data Safety Monitoring Board ("DSMB") recommended continuing the CHABLIS-SC1 clinical study following the second scheduled interim data and safety review. To date, we have enrolled over 50% of the 400 patients planned for the CHABLIS-SC1 study. Enrolled patient demographics and disease characteristics for the CHABLIS-SC1 study are consistent with our goal to enroll patients with higher levels of lupus activity and positive biomarkers despite the stable use of corticosteroids. These characteristics appeared predictive of improved outcomes in our previous Phase 2 clinical study. Additional information and publications from the CHABLIS-SC1 clinical study can be found at http://www.anthera.com/studies_chablis-sc1.htm. We have submitted the final protocol to the US FDA for our second lupus registration study, CHABLIS-SC2. This second study is expected to enroll up to 400 patients with active lupus, including patients with glomerulonephritis who may have a previous diagnosis of Lupus Nephritis. Consistent with the CHABLIS-SC1 clinical study, the primary endpoint of this second study will be the SRI-8 response. These two pivotal studies will form the basis of a submission for blisibimod as a treatment for patients with active lupus. The BRIGHT-SC clinical study is currently recruiting patients with a biopsy-proven diagnosis of IgA nephropathy in seven countries in Southeast Asia. We have begun expansion of the BRIGHT-SC study's footprint in Europe, Canada and Japan and expect to enroll patients in the new geographies in the fourth quarter of 2014. It is our plan to conduct an interim analysis to determine the effect of blisibimod on proteinuria after eight weeks of treatment in the second half of 2014. In April 2014, we met with Japan Pharmaceuticals and Medical Devices Agency ("PMDA") to discuss our registration program with blisibimod in patients with IgA nephropathy. In this meeting we gained the PMDA's agreement on the acceptability of proteinuria as the primary efficacy endpoint to support marketing approval in Japan and have amended the BRIGHT-SC study to meet the specific data requirements of the PMDA. We believe blisibimod and the BRIGHT-SC clinical study represent the only therapeutic approach intended to specifically target the underlying biological problem of IgA nephropathy - immunoglobulin complex formation. Unlike other potential anti-inflammatory treatments for IgA nephropathy, blisibimod's specific targeting of B cells and plasma cells may safely reduce IgA and IgG production and inflammation and potentially halt further damage to the kidney - key to improving clinical outcomes. "​​interim analysis to determine the effect of blisibimod on proteinuria after eight weeks of treatment in the second half of 2014." Look like institutions still believe in ANTH success. But why ANTH pps is declining? Funds and MMs just created "illusion of falling knife" ​for ANTH i.e. situation when all retail investors should start to believe that ANTH pps declines because everybody knows that clinical trials will fail. Retail investors will never buy company with permanently declining pps and even if they bought it before they will sell it after 10-15% losses accumulated. They sell and funds buy. Funds and institutions now own 45% of "falling knife" stock and slowly increase their positions. With help of MMs they can do it easy without pps increasing ("illusion of falling knife" scared all retail investors and force them to sell ANTH). So, when ANTH lupus results will be released and pps will jump to $20 all gain will belong to Big Money. Question is how to outplay BM? ​​What is the probability of ANTH drug success? Company already failed lupus trial because "blisibimod did show some favorable results, the primary endpoint that was based on the "SLE responder index" for the pooled blisbimod dosage groups was not met." "What was especially interesting were the results for patients that were part of the SRI-8 category. The SRI categories were made to further organize patients - specifically by the improvement in SELENA-SLEDAI scores. Patients that were in SRI-5 (those who didn't do as well) underperformed SRI-8 (the best performers) by a very significant margin. According to the company's own analysis, this means that those who respond to blisbimod's mechanism see especially positive results. "it became a bit more obvious that the trial's failure was also due to some misunderstanding of how blisbimod affects lupus patients. Blisbimod works specifically through the BAFF (B-cell Activating Factor) pathway, which is associated with a variety of autoimmune diseases including lupus. The causes of Systemic Lupus Erythematosus (or SLE) isn't fully understood, but it seems that the patients that are majorly affected by BAFF can see major benefit by taking blisbimod. Undoubtedly, ​​that patient stratification (strong response to BAFF blockage) was pivotal strategy for inclusion in new Phase 3 lupus clinical study, CHABLIS-SC1, is recruiting at 12 countries in Eastern Europe, Latin America and Southeast Asia. In July, 2014 an independent Data Safety Monitoring Board ("DSMB") recommended continuing the CHABLIS-SC1 clinical study following the second scheduled interim data and safety review. To date, ANTH have enrolled over 50% of the 400 patients planned for the CHABLIS-SC1 study. ​​BAFF (B-cell activation factor belonging to the tumor necrosis factor family) is a crucial homeostatic cytokine for B cells that is upregulated during inflammation and links adaptive with innate immunity. Excessive levels of BAFF may alter selection of autoreactive B cells and contribute to perpetuation of SLE by a variety of mechanisms. BAFF antagonists have been effective in the prevention and treatment of SLE in several different murine models. Three classes of BAFF antagonists have been developed for clinical use, and initial clinical trials have begun. However, immune modulation in SLE is complicated by differences in the immune defects between patients and at different disease stages. Further work will be needed both in animal models and humans to determine the most appropriate clinical applications for BAFF blockade. The truth is that funds/institutions know that current ANTH phase ​​III trial for lupus has very high probability of success (>75-80% to meet primary points). And they know that cap for biotech with effective lupus drug (may be more effective than HGSI lupus drug) is not $36M but at least $1B (pps $43). As usually retail investors will get very small (if any) percentage from future ANTH gain: at this point "magically" >80% of ANTH shares will belong to funds and institutions. ​​​Again funds/institutions increase positions in biotech with declining pps... Are they fool and stupid to catch "falling knife"? Nope. It's just an "illusion of falling knife" created by them to scare retail investors. Strategy for accumulation: "Scare retail investors by false info, force them to sell shares at low price and buy and accumulate cheap shares of future biotech gem​​". Also declining stock will repel any trading machines from buying - trading software are designed to buy only growing stocks. But if they were designed for shorting trading machines will short such declining stock. ANTH short interest has spike at 7/31/14 and now it decreases. During September at least 3M shares were sold and bought (>10% of total outstanding shares). ​​​​HAYWARD, Calif., Oct. 1, 2014 /PRNewswire/ -- Anthera Pharmaceuticals, Inc. (ANTH) today confirmed it is engaged in potential partnership negotiations for blisibimod for both lupus and IgA nephropathy in territories outside the United States. Anthera does not intend to communicate further regarding these discussions unless and until a definitive agreement is executed. There can be no assurance that such a definitive agreement will be executed relating to any proposed partnership, or that any partnership will be approved or consummated. "While we cannot be certain of the eventual outcome of our strategic discussions, our negotiations have reached a point where we believe it is important to hold off on further updates regarding the blisibimod clinical program," commented Paul F. Truex, President and CEO of Anthera. "We will provide further information regarding the status of the blisibimod clinical program upon completion of these negotiations." Translation: BP will partner with ANTH and may be ​​will pay huge upfront and royalties together with cost for clinical development. ANTH pps can spike to $4 and higher. But Big Money don't want to share any gain with retail investors and will continue to decline this stock and accumulate cheap shares.